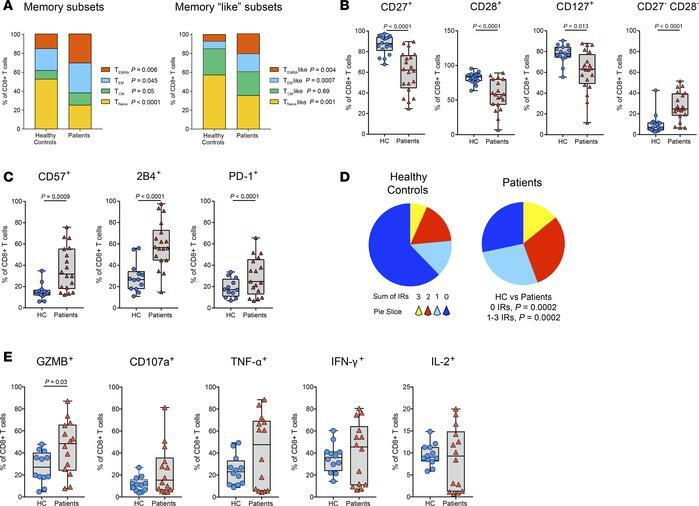 CD8+ T cells from AML patients display phenotypical features of exhaustion and senescence, but are able to secrete cytokines. Pretreatment PB T cells from newly diagnosed AML patients (n = 20) and healthy controls (HCs) (n = 18) were analyzed by multiparameter flow cytometry. P values were calculated using Mann–Whitney U test (A–E). (A) CD8+ T cell subsets according to CD45RA and CCR7 (left), and CD45RA and CD27 (right). (B and C) Expression of (B) stimulatory receptors, and (C) the senescence marker CD57, and IRs (2B4, PD-1) on CD8+ T cells. (D) Boolean gating analysis of the coexpression of PD-1, CD57, and 2B4 on PB CD8+ T cells. Pie slices represent the number of coexpressed markers (0–3) analyzed with SPICE software. (E) Expression of effector molecules and cytokines on CD8+ T cells.